Cash Out betting has become a very popular concept among punters worldwide. Namely, this relatively new feature allows bettors to have much more control over the bets they place. Therefore, they can score guaranteed winnings or control losses. However, it is not the best action in every situation. Therefore, punters, especially rookies, should get familiar with the feature before using it. So, we have created this comprehensive guide and everything you need to know about it. 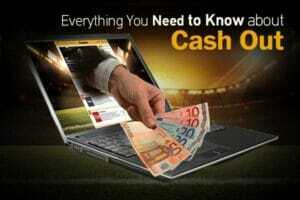 CashOut is a feature that allows bettors to resolve their bet during the game. In other words, the bookmaker is giving you a live offer for your bet, which you can accept before the game ends. Let us better explain with an example. Let’s say there is a game between Arsenal and Chelsea. You decide to back Chelsea with a £10 bet at odds 2.00. This means if Chelsea wins you will get a total payout of £30 (£10 bet + £20 winnings). However, let’s say Chelsea has the lead 1-0 at the 75th minute, but playing badly. At this point, you are starting to worry that they can easily lose the lead and you can lose your bet. This is where the Cash Out betting features comes in play. So, for example, if you accept to resolve the bet you will get a payout of £25 or £27. By going for this option, you make sure to make the most out of the current lead Chelsea has, rather than worry that Arsenal will score. However, the payout you get is for £5 or £3 lower than the one you would’ve received if you waited until the end of the game. In other words, you lower your risks and consequently get a lower payout. When is Cash Out betting Offered as an Option? CashOut is a great feature. However, it is not always offered as an option. Actually, it can be used only In-Play. This means, if your match is currently restricted in terms of live betting you won’t be allowed to Cash Out. Also, if In-Play betting is no longer an option for the game until its end, you won’t be able to CashOut either. When to Avoid Using the Cash Out betting Feature? The CashOut feature is excellent for both scoring winnings and managing losses. So, generally, if you are not sure your team will win, it’s smart to us it before the end of the game. Also, it’s recommended to Cash Out if your team is losing and has low chances of recovering. This way, you will probably lose less money than your entire bet. Nonetheless, this doesn’t mean that it is always the smartest option. On the contrary, there are scenarios where punters should avoid the feature. Generally, you shouldn’t CashOut if the winnings are lower than your initial bet. We often highlight the importance of being able to afford to lose a bet. So, it is always recommended to avoid placing bets you cannot afford to lose. Consequently, in certain scenarios, it is better to take a risk and possibly hit a juicy prize rather than to take only £2.50 from a £10 bet. Players should know that there are several different types of choices. Below, we will explain the most commonly offered ones. Just like the name suggests, full this is when you decide to CashOut your entire bet. For example, if you placed a £20 bet and then used the option for the full amount. Partial CashOut lets you have back only a part of your stake, while the rest remains in the game. For instance, if you placed a £20 bet, with the partial choice you can have only £10, while leaving the other £10 until the end of the game. So, if you expected to win £500 with the initial £20 bet, in case your partial £10 bet wins you will get only £250. Naturally, you will also add to this prize the amount received for the first £10, however big or small. This is a useful and relatively new feature. The Αuto option enables bettors to have their money back, as soon as the desired offer arrives. In other words, if you think that it is acceptable to CashOut a £10 bet with 2.00 odds for £15, you can set this on the platform. Then, if the offer appears, the transaction will be automatically completed, without you having to interfere or even be logged into your account. This is also a new feature, which is not necessarily related to the main option. Alternatively, this feature lets punters edit i.e. change their bet once it was placed. This option is featured under the main option’s section and lets you act upon new information. For example, you have placed a bet on a team and then found out that their lead player is injured. By using the Edit Bet feature, you can adjust your bet accordingly. This, however, often comes with certain setbacks and losses. Yet, it’s still better than risking the entire stake.